Paul and Sue Bergstrom's modern take on a traditional African thumb piano boasts an amp-compatible design. This petite instrument carries with it thousands of years of African musical tradition. 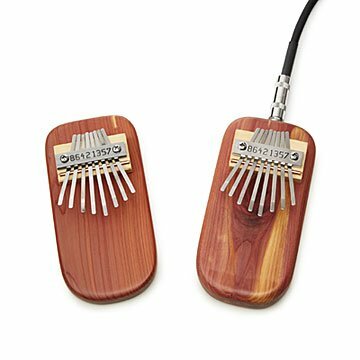 Called a kalimba, mbira, mbila, or marímbula depending on the region in which it's played, the first version of this handheld thumb piano originated in Africa over 3,000 years ago! Lightweight and portable, the thumb piano was the chosen instrument of traveling troubadours, who would retell the history of their tribe in song. Whether you use it to strike up your own story or to teach little ones about music, Paul and Sue Bergstrom's handcrafted thumb piano is the ideal instrument to carry a tune. Atop a beautiful, cedar plank are 8 numbered tines that correspond with traditional notes on the diatonic scale. The tines, or keys, are made of tempered spring steel that is hand-cut and rounded. To play, simply cradle the instrument in your hands and pluck the tines with your thumbs. This modern version is also amp-compatible, so it's ready for band play-alongs and to satisfy all your sampling needs! Handmade in Blairsville, Georgia. Includes easy-to-follow songbook filled with traditional melodies like "You are my sunshine," "Kumbaya," and "Happy Birthday." Please note, the Electric Thumb Piano does not come with an amp cord. Connection is a standard .25" jack. I know what everyone is getting for Christmas! It's handheld, simple to use and easy to learn, even if you're not a musician or musically inclined. The person I gifted this to is a large individual with big hands - and he has no problem with keys (which is what I feared, initially). Great for all ages and skill levels. Unique Item. Just what I was searching for! Sam liked it and plays it. He has an interest in music and it keeps him busy. This was a perfect gift for my brother, a musician. I have not seen electric kalimbas before this one. My brother, or any of his band mates had either. Everybody was blown away by the sound of this when plugged in. It produces magical sounds, especially when routed through effect pedals. I would is product again. Small and portable. Doesn't take up much room when traveling. Customer service responded to my email saying that we could adjust the bristles ourselves. This should be in the description of the item. If it had been, I wouldn't have purchased it. Just saw this in your catalog and it sang or his name to us. The output jack on this kalimba opens it up to the world of effect pedals and synthesizers. Endless variations on a beautiful sound! A cute little stocking stuffer for a piano lover. This item was a gift and the recipient was pleased with the gift.